I am simultaneously excited and nervous whenever I read a duo-authored book – especially when the two authors are writers whose work I love.�Just Like Fate by Cat Patrick and Suzanne Young is a book that I have waited way too long to read. It’s also a book that’s co-authored by writers who are among my favorites when it comes to young adult books. Oh my goodness, it is hard for me to put into words just how much I loved this collaboration and how much I want there to be more collaborations between Cat Patrick and Suzanne Young. Just Like Fate opens with two chapters of BEFORE, showing the event leading up to main character Caroline’s big decision. In these two chapters, we learn that Caroline’s grandmother has had a stroke. Caroline is pulled out of school for this. Over the next few days, her grandmother is transferred from the hospital to hospice care. Her grandmother does not show any signs of changing her status — either pulling through the stroke or dying. So, when Caroline receives a phone call from her best friend, Simone, to go to a college party she is faced with the decision of STAY or GO and so, this parallel decision book explores what happens if Caroline goes and what happens if Caroline stays in alternating chapters. Regardless of plot line, I loved reading about Caroline. I loved her older brother, Teddy. I loved her tumultuous relationship with her older sister Natalie and I loved her relationship with Gram, whom she actually lived with before her Gram had a stroke. Here’s the thing, no matter Caroline’s choice, her Gram still dies and she still deals with the outcome. In the Stay plotline, Caroline ends up staying with her Gram, obviously. She hears her Gram’s dying words and wishes, because her Gram is lucid for this. She gets some solid advice about love from Gram. In the Stay storyline, Caroline’s love interest is this boy that she has had a crush on for years, Joel. He’s the serious, artistic type and the two have musical taste in common. But, is Joel all that Caroline has imagined he will be? That’s the crux of the Stay storyline. The Go storyline is clearly based on what happens if Caroline goes to the party. I have to tell you guys, this is my favorite of the two plotlines. It’s a bit more swoonworthy and sweet. I know, I know, Caroline is a terrible person for leaving her Gram’s deathbed to go to a party, but honestly she did not think her Gram would be dying and her Gram made no change. Girl just needs to live her life, you know. Maybe that makes me terrible, but that’s just how I feel. In this plotline, Caroline meets a boy named Chris and the two are drawn to each other like magnets. He’s got a bit of a reputation for being a player, but there’s something different about Caroline. ALSO OMG he sings Sweet Caroline to her. And he’s a musician. And whatever, the relationship or the chemistry between them is like, the best romance. Really, I just kept flipping pages for this storyline. Granted, the Stay storyline is great too, I just loved this one more. I genuinely loved�Just Like Fate. I loved that I flipped to the end to find out which choice she makes, but that it doesn’t matter what her choice is. Caroline ends up in the exact same place. I love that my choice in this pseudo-love triangle makes an appearance in both parts. I love that this book takes like a hot second to read because it was so good and I could not put it down. I loved all of the feels that I got while reading. Come to think of it, I am pretty sure I teared up while reading and also laughed and definitely was into the romance for sure. I loved the character development. I loved how seamless the alternating chapters were, even though the two plotlines go in different directions. Really, looking back two months after reading�Just Like Fate by Cat Patrick and Suzanne Young, I can’t help but still feel as strong in my love of this book. Loved the premise. Loved this book, although sometimes got confused as to which timeline I was in. Great review. Made me want to read it again. This book sounds awesome! Definitely going on my TBR list. 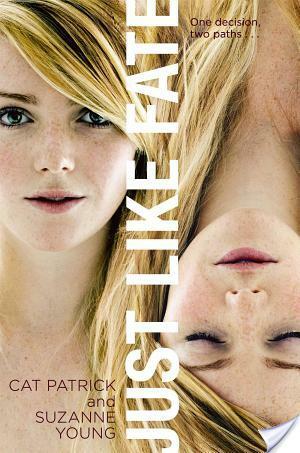 Your review of Just Like Fate really makes me want to read it! I was already curious before, and I know that a lot of people liked it. But to see so concretely how enthusiastic you are about it just gives me even more of a reason to want to read it. Glad you enjoyed it!